Greenhouse effect and air pollution have been global challenges. 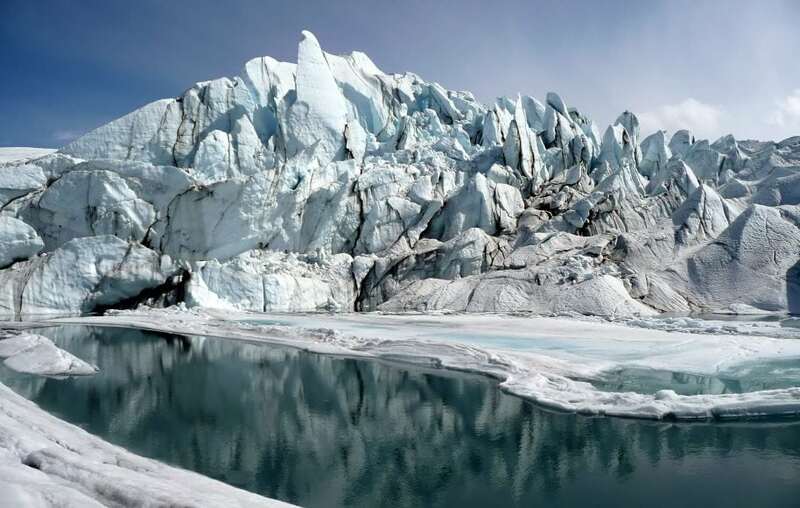 Melting glaciers, extreme weather, drought, and haze all threaten human survival. 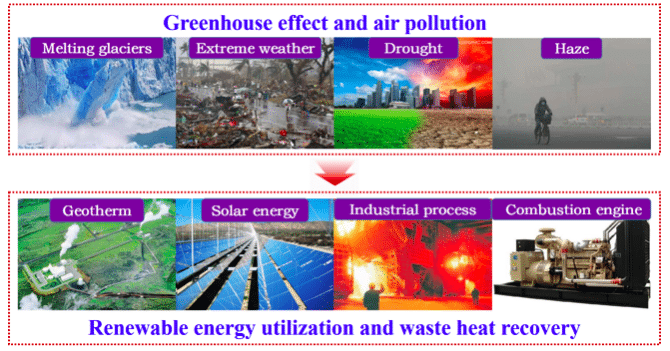 Renewable energy utilization and waste heat recovery are recognized as key approaches to weakening greenhouse effect and air pollution. Exploring the efficient utilization technology for renewable energy and waste heat has attracted worldwide attention. Organic Rankine cycle (ORC) is an important and promising heat-power conversion technology that has been widely used in renewable energy (e.g., solar thermal, geothermal, and biomass energies) and waste heat recovery (e.g., combustion engine exhaust, industrial flue gas, and hot processed liquids) around the world. ORC is based on the principle of the Rankine cycle and uses organic fluids as working fluids. It has advantages of stability, flexibility, safety, as well as wider applicable ranges of the heat source temperature and installed capacity; compared to other heat–power conversion technologies utilizing the low and medium temperature (<350°C) thermal energy. ORC has been a worldwide hot study issue, and its application is also continuously expanding. Conventional subcritical ORCs are based on the single evaporation pressure, as shown in Fig. 2. Although the cycle concept is simple, the performance is generally considerably lower than the theoretical ceiling for a given heat source and heat sink. Therein, the exergy loss during the finite temperature difference heat transfer between the working fluid and heat source fluid (i.e., in the heat absorption process of the cycle) is generally the largest and can exceed 40% of the total exergy loss. Reducing the exergy loss in the heat absorption process is crucial to increase the energy utilization efficiency for a conventional ORC system. Dual-pressure evaporation cycle is an emerging concept in the ORC field. It involves two evaporation processes with different pressures and an isobaric condensation process, as shown in Fig. 3. Dual-pressure evaporation ORC can significantly reduce the exergy loss in the heat absorption process because the number of optimizable cycle parameters is increased (e.g., the pressure, working fluid mass flow rate and superheat degree in each evaporation stage). Thus, the heat absorption process of the cycle can be designed more suitably to adapt the heat release characteristics of heat source fluid, compared to conventional single-pressure evaporation ORCs. The adaptability for heat sources with various characteristics is also improved. Advantages of dual-pressure evaporation cycle in the thermodynamic performance have been proven by several studies. For the ORC technology, using the cycle type of dual-pressure evaporation can further enhance its thermodynamic advantages compared with other heat–power conversion technologies utilizing the low and medium temperature thermal energy. That is helpful for the popularization of ORC technology around the world. However, several crucial questions in the dual-pressure evaporation ORC remain indeterminate and are urgently in need of answers. Firstly, most of the existing studies on the dual-pressure evaporation ORC are based on the specific heat source temperature. As the heat source temperature increases, the variations in the optimal cycle parameters and thermodynamic performance of dual-pressure evaporation ORC remain indeterminate. Secondly, for several certain heat source temperatures and working fluids, the thermodynamic performance of dual-pressure evaporation cycle may be even worse than that of the single-pressure evaporation cycle. The applicable heat source temperatures of dual-pressure evaporation cycle where its thermodynamic performance is better, remain indeterminate thus far. Finally, effects of the working fluid thermophysical properties on the applicable heat source temperatures of the dual-pressure evaporation cycle also need to be revealed. Solving these crucial questions is vital for the application and promotion of dual-pressure evaporation ORCs. A systematized study focused on dual-pressure evaporation ORCs driven by heat sources of 100–200°C was carried out. Nine common pure organic fluids were selected as the working fluids. For various heat source temperatures, the optimal evaporation pressures and evaporator outlet temperatures of the single-pressure and dual-pressure evaporation cycles were obtained, which could achieve the maximum system net power output. The system thermodynamic performance of two cycles was analyzed and compared, and a quantitative criterion was provided to assess the optimal cycle type. 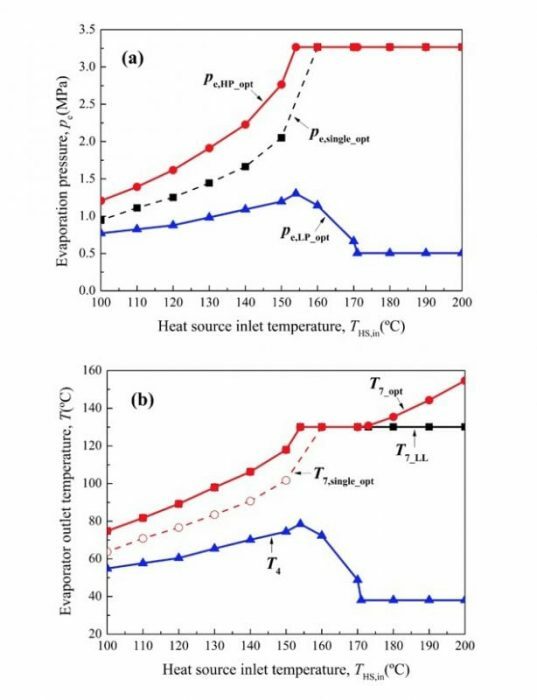 Effects of the working fluid thermophysical properties on the applicable heat source temperatures of dual-pressure evaporation cycle were also revealed. Variations of the optimized evaporation pressures and evaporator outlet temperatures are generally similar for nine working fluids, as the heat source inlet temperature increases. R600a is taken as an example to introduce the detailed variations. 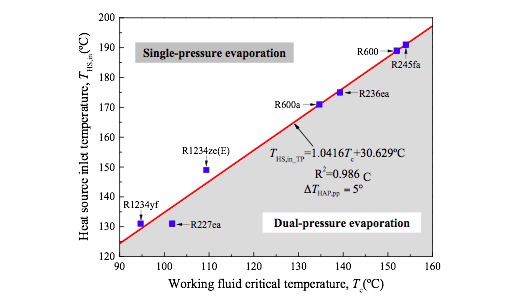 The optimized cycle parameters of dual-pressure evaporation ORCs using R600a are shown in Fig. 4. The optimized evaporation pressure of the high-pressure stage (Pe,HP_opt) increases until its upper limit is reached; whereas the optimized evaporation pressure of the low-pressure stage (Pe,LP_opt) initially increases (when Pe,HP_opt < Pe,HP_UL) and then decreases until its lower limit is reached (when Pe,HP_opt = Pe,HP_UL), as the heat source inlet temperature increases. 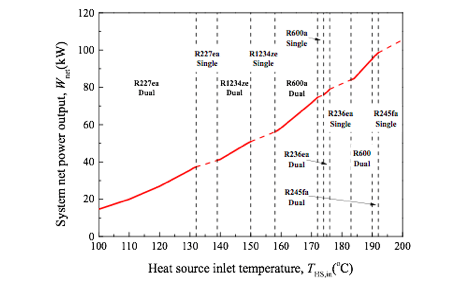 The optimized evaporator outlet temperature in the high-pressure stage (T7_opt) is equal to its lower limit corresponding to the Pe,HP_opt when Pe,LP_opt > Pe,LP_LL, whereas it is generally higher than its lower limit and increases as the heat source inlet temperature increases when Pe,LP_opt = Pe,LP_LL. 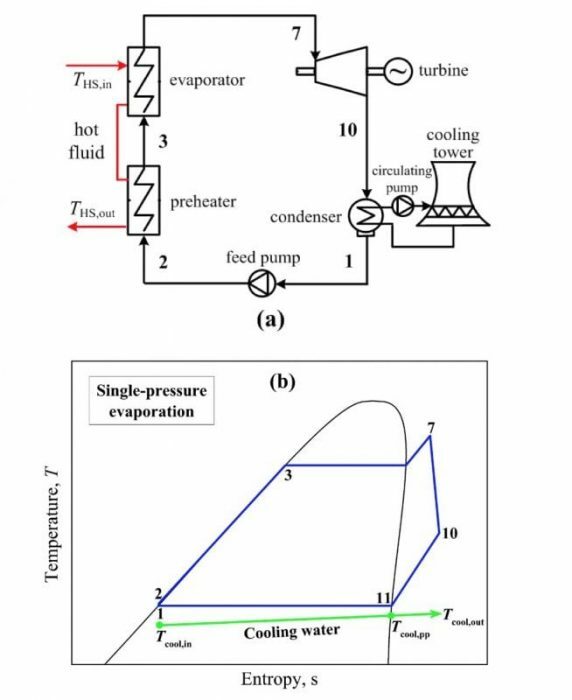 In addition, the evaporator outlet temperature in the low-pressure stage ( T4) was selected as the lower limit corresponding to the evaporation pressure of the low-pressure stage in this study. where Tc is the working fluid critical temperature, and ΔTHAP,pp is the pinch point temperature difference in the heat absorption process. When the heat source temperature is higher than THS,TP, the maximized system net power output of dual-pressure evaporation cycle will be equal to that of single-pressure evaporation cycle. The single-pressure evaporation cycle can be considered as a special form of the dual-pressure evaporation cycle. Furthermore, for the dual-pressure evaporation cycle, the relative increment in the maximized net power output generally increases as the heat source temperature decreases. The maximum increments are 21.4%–26.7% (ΔTHAP,pp = 5º) for nine working fluids. In addition, for heat sources of 100–200°C, the optimal cycle types, optimal working fluids, and maximum net power outputs of ORC systems were also provided, as shown in Fig. 6. These findings are described in the article entitled Parametric optimization and thermodynamic performance comparison of single-pressure and dual-pressure evaporation organic Rankine cycles, recently published in the journal Applied Energy. This work was conducted by Jian Li, Zhong Ge, Yuanyuan Duan, and Zhen Yang from Tsinghua University, and Qiang Liu from the China University of Petroleum. Yuanyuan Duan is a researcher at Tsinghua University Department of Thermal Engineering. He has authored/co-authored over 200 publications and has over 2,500 citations. His main research areas include thermal engineering, energy conversion, refrigeration and cooling technologies, and energy engineering.